Only a few years ago, a review of the gins launched at the annual TFWA World Exhibition in Cannes would have made for a very short read indeed. How times have changed. The most recent show in Cannes this October saw multiple gin launches into duty free from distilleries all around the world. 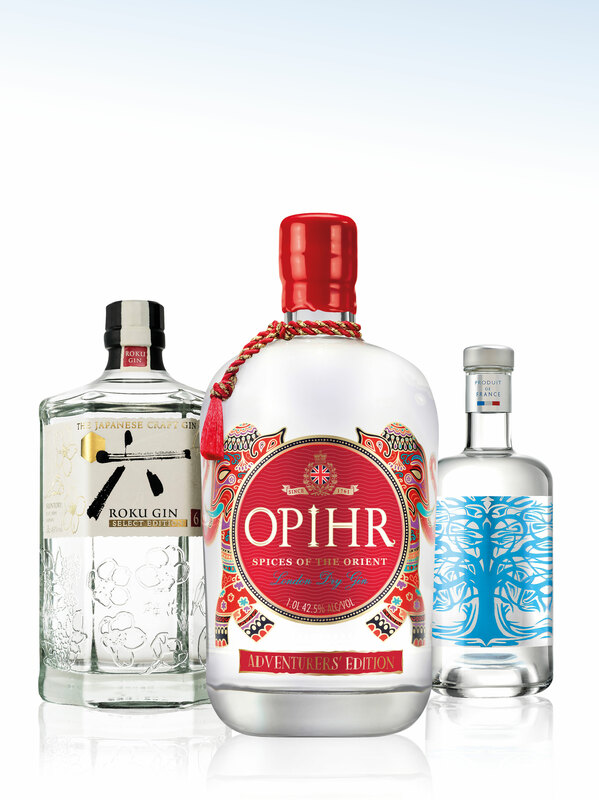 English, French, Estonian and even Japanese gin brands all unveiled new products at the show, eager to grab a slice of an exciting category that is growing faster than any other white spirit in Travel Retail. One of the most high-profile launches at this year’s show was Opihr Gin Adventurers’ Edition, a new Global Travel Retail exclusive edition of the famously aromatic, spiced gin, which will be available on shelves at the beginning of 2018. G&J Distillers’ master distiller, Joanne Moore, was inspired by the maritime spice route when creating this new gin, bottled at a slightly higher strength of 42.5% ABV than the parent brand. Moore dials up the levels of ginger and woody spice in the flavour palate of this new expression. The effect is to create a robust, well-rounded gin with a rich, warm and earthy nose, and spice and citrus notes on the palate, giving way to a peppery finish. The Opihr Gin Adventurers’ Edition bottle comes with a wax-dipped closure and an illustrated map on the bottle’s back label evoking the history and heritage of the maritime spice route. Japanese whisky has been a hot ticket in duty free over the past five years with bottles of popular brands such as Hakashu, Hibiki, Yamazaki and Nikka snapped up almost as soon as they go on shelf. Now the first Japanese gins are set to start making their appearance in Travel Retail. For instance, at Cannes, Beam Suntory showcased a Travel Retail version of its Japanese craft gin brand Roku called Roku Select Edition, which is available now at leading European hub airports such as Copenhagen, Frankfurt and London Heathrow, as well as Dubai airport. ‘Roku’ means ‘six’ in Japanese and Roku Select Edition boasts six Japanese botanicals: Yuzu peel, Gykuro tea, Sansho pepper, Sencha tea, Sakura flower and leaf. These six Japanese botanicals are combined with eight more traditional gin botanicals (coriander seeds, angelica root, cardamom seeds, cinnamon, bitter orange peel, juniper and lemon peel) to create a complex gin with a floral nose and a smooth, silky palate that features traditional gin flavours along with Japanese botanical notes. Roku Select Edition comes in a distinctive hexagonal bottle and features the Japanese kanji symbol for six on the bottle label, which is made from traditional Japanese washi paper. Priced at around €27.50 (£24.55) for a 70cl bottle, Roku Select Edition is intended to be enjoyed neat on the rocks or as a part of a simple Japanese G&T, which is served with ice and slices of ginger to complement the gin’s refreshing citrus notes of yuzu. From Osaka, we fly over to the Baltic state of Estonia and the artisanal Crafter’s London Dry Gin, which also made an appearance at Cannes. The recipient of multiple design and spirit competition awards, Crafter’s is flavoured with a mix of handpicked Nordic botanicals such as juniper berries, fennel seeds and the rarely used flowering herb veronica. They are distilled in small batches in an antique copper pot still to create a flowery, soft tasting gin with a floral nose, hints of juniper and citrus zest and a spicy, fresh taste, counterbalanced with the bitterness of pink grapefruit. Lastly, it’s only fitting that we end this review of a French trade show with a French gin in the form of Source Gin. It is produced by H Mounier, the owner of Hubert de Polignac and Hardy Cognacs. Presented in a striking blue transparent bottle depicting the tree of life, Source Gin is produced with a French wheat-derived base spirit which is redistilled twice more and left to marry for 10 days to stabilise and create a rounder, longer-lasting flavour profile. Priced at around €22.90 (£20.45) per bottle, Source Gin offers lots of fresh ginger and vine fruits on the nose; juniper and spice on the palate, and an aromatic finish with a hint of lemon zest.